SHE IS A CHILD OF DESTINY, A BELIEVER IN THE DIVINE POWER OF GOD. The true life story of OBANYE FRANCESS CHIZOBA is an inspiring story of resilience, determination to succeed in the midst of stiff opposition. 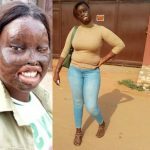 Her Uncle’s wife poured raw acid on her over altercation, and God raised for her an helper of destiny, a quiet millionaire who in 24 hours assisted her to raise the sum of 10,000,000 Naira for her plastic surgery, so her face can be normal again. 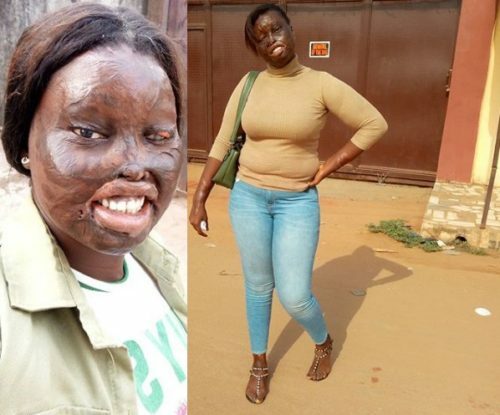 Breaking this news on Instagram, a silent Nigerian millionaire whose social media handle is @kbkonline took to his Instagram account to announce that he just helped an acid attack survivor Obanye Chizoba raise about 10,000,000 Naira for her plastic surgery within 24hrs. A: My name is Obanye Francess Chizoba. I am from Anambra state, hailed from Onitsha. I am the last child of my parents. I graduated recently at Anambra state University, where I studied Biochemistry. Q: Were there anytime you feeling emotionally depressed? A: Not at all. I feel since I cannot change anything, it is of no use. Just that as a human being, at times you got to think about your life. Q: What are your greatest challenges in life? A: I will say it is money for my surgery and may God to bless me abundantly. That is the remedy am looking for now. Q: Meaning you are already saving for the surgery? A: Not at all. I am believing in the Omnipotence and supremacy of God for quick divine intervention. Q: How has it been like for you growing up with an irregular scars? A: The acid attack and scar happened when I was very tender. Have you ever have this feeling of people you grow up with seeing you and running away from you? That is the most painful part. When you go out, people will look at you and be scared of you, little kids will see you and run away, they will cry as if they saw a ghost. If you have a problem with your fellow girl, she will insult you with what happened to you. God! It was not easy but grace was too sufficient. I accepted my challenge and I looked for solution on how to move on. Thank God for my mum who was always there giving me courage. I started going to school, pairing with my mates and being happy. Q: How did you get the scar? A: Acid burn. I was poured acid by my uncle’s wife due to family problem. Q: At what age and what happened to her after she did that? A: At the age of 9 years, she ran away since then. Unfortunately, I had been the victim. Q: What kept you on all this while? A: From my mum, those people out there are not better than you. Believe strongly in yourself. God has a reason for you been like this which is why from that day he gave me that name ‘Chizoba’ and that is the fact. And do you know what i hate the most? ‘pity’’, it makes me have the feelings that I am different. Q: Are you into any relationships? A: I do not have the strength been in love because I do not want any problem to be added to the one I have already, so I prefer having bestie. I found out that if you have a male bestie, with time you will start having feelings for each other. There is this guy that is always there for me and he gives me advice and cares alot about me. He is always proud of me no matter what people are saying. Q: What advice do you have for those facing this challenges of yours? A: Do not let your challenges hinder you from what you want to do and be in life, just over come and move on. Never give up on life no matter how hard it is. Q: Is there way people can contact you?